Laura Halford won three Commonwealth Games medals for Wales at Glasgow 2014. Laura Halford took her tally of 2015 British Championship gold medals to four with wins in the ball, hoop and clubs categories on Friday. 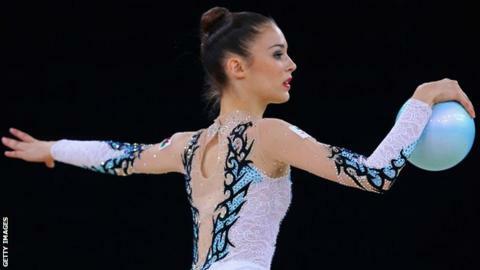 The Welsh athlete, 19, defended her all-around title on Thursday. Halford also claimed silver in the ribbon final, with Gemma Frizelle winning ribbon bronze as well as silver in the ball and bronze in the hoop. Welsh aerobic gymnast Kayleigh Silva retained her senior women's individual title with a score of 20.800. "I'm delighted to have won the title again," Silva said. "Competing here in Liverpool has been incredible, it's great for the sport to have such a huge crowd and get so much attention. "To be British champion again against my team-mates who are all amazing is brilliant." Halford's victory in Liverpool on Thursday completed a hat-trick of senior titles after her successes in 2013 and 2014.